რუსეთ-იაპონიის ომი – ომი რუსეთსა და იაპონიას შორის. მიმდინარეობდა 1904 წლის 8 თებერვლიდან 1905 წლის 5 სექტემბრამდე. ომი დაიწყო მანჯურიის და კორეის ბატონობისთვის. Chapman, John W. M. (2004). "Russia, Germany and the Anglo-Japanese Intelligence Collaboration, 1896–1906", Russia War, Peace and Diplomacy. London: Weidenfeld & Nicolson, გვ. 41–55. ISBN 0297849131. Connaughton, R. M. (1988). 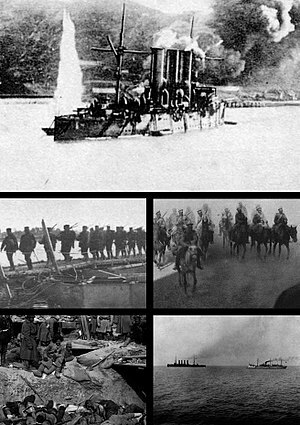 The War of the Rising Sun and the Tumbling Bear—A Military History of the Russo-Japanese War 1904–5. London. ISBN 0415009065. RussoJapaneseWar.com, რუსეთ-იაპონიის ომის კვლევის საზოგადოება. ეს გვერდი ბოლოს დარედაქტირდა: 14:04, 22 მაისი 2017.